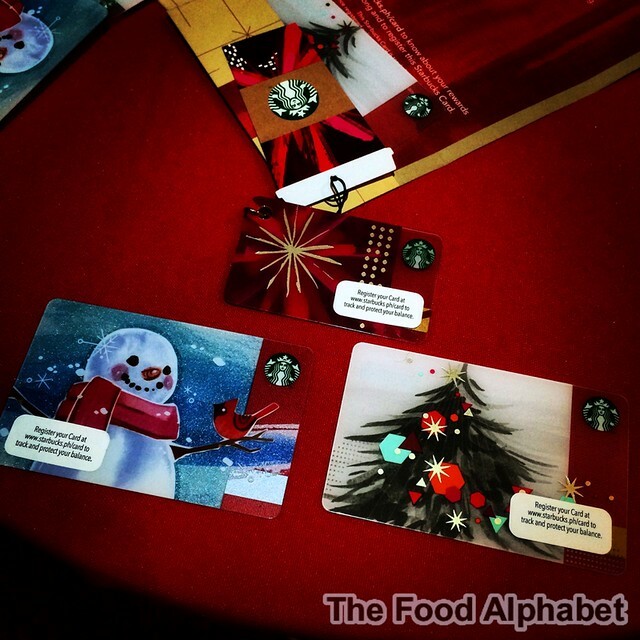 The Food Alphabet and More: Load up a new Starbucks Card today and get Additional load FREE! Load up a new Starbucks Card today and get Additional load FREE! Today is the Day! Christmas at Starbucks officially starts today! The cool breeze is coming and so are these Starbucks amazingly looking Starbucks Cards! Yup the new ones are coming out today, and of course the Starbucks Philippines 2015 Planners as well. And to celebrate the start of the start of the Christmas season, Starbucks gives you more reason to celebrate with these wonderful promos. 1.) Activate a new Starbucks Card from Nov. 3 - 5 with at least P1,500 load and get an additional P300 load! This offer is valid for all new Starbucks Cards, including the new 2015 Christmas Starbucks cards including the Mini Card as well. 2.) Be one of the first 200 - 300 to purchase a beverage at Starbucks today and get your first planner sticker FREE, so you get 2 stickers at once! 3.) Purchase a beverage with your Starbucks Card, and you get both the Beverage Star and a Planner sticker. So what are you still sitting there for, go now to your favorite Starbucks store and go get yours!